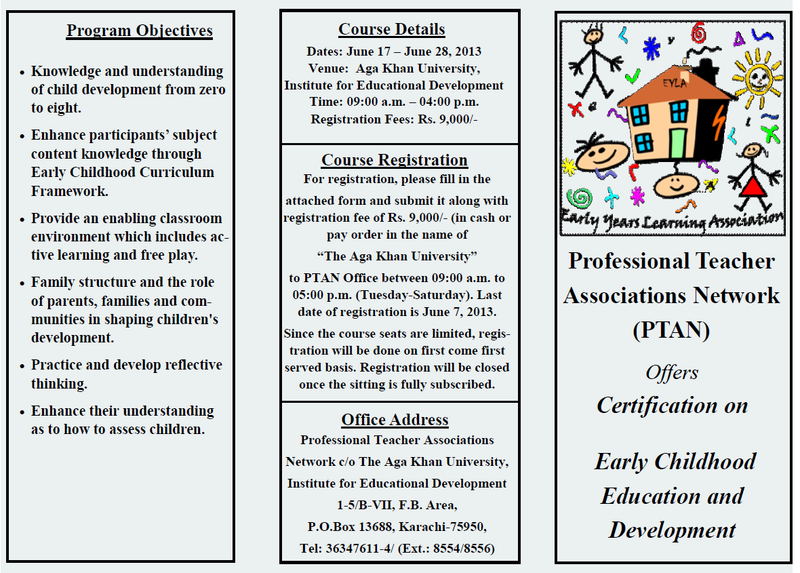 EYLA-PTAN Certification on "Early Childhood Education and Development"
ASSET-PTAN Certification on "Effective Teaching & Learning at Secondary Level"
For Registration, please fill in the attached form and submit it along with registration fee of Rs.9,000/- (in cash or payorder, in the name of The Aga Khan University) to PTAN office between 09:00 a.m. to 05:00 p.m. (Tuesday—Saturday). Last date of registration is Saturday, June 30, 2013.Since the seats are limited, registration will be given on first come first served basis. Registration will be closed once the sitting is fully subscribed. It is a pleasure to inform you that this month ASSET is organizing a workshop titled “Creating Positive Learning Environment in the Classroom”. 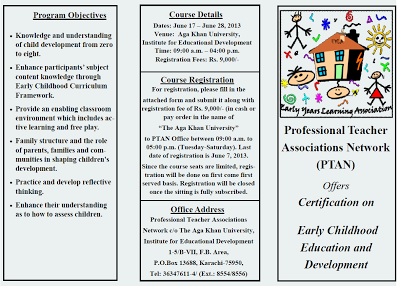 Below are the details of the workshop. The attitude, traits and personality of the teachers along with effective teaching strategies are essential for learning of the students. 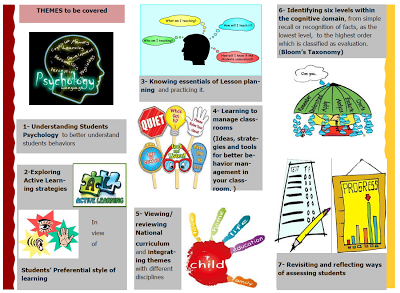 No matter how effective the curriculum or pedagogy it may be, but without establishing appropriate classroom environment, the objectives of teaching-learning cannot be appropriately achieved. Therefore, the foremost essential task of the teacher is to create an environment that itself encourages the students for learning. 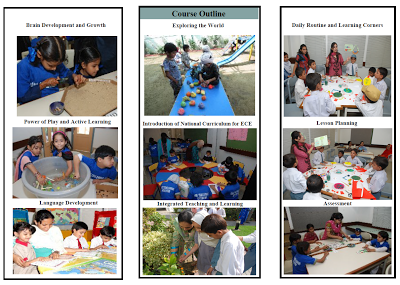 Modern theories and researches have changed the perception of traditional concepts of classroom management. The paradigm of keeping students quite has shifted to active engagement of learners in the task. · Reflect on admirable qualities of teacher to optimize classroom climate. · Familiarize with ideas of developing positive relationship with students and helping them to reinforce desirable behavior. Mr. Munir Lalani is a committee member of ASSET (Association for Social Studies Educators and Teachers). He is MEd. graduate from Notre Dame Institute of Education and has done Masters in General History from the University of Karachi. He has also done extensive research on perception of students about effective teacher, cooperative learning and challenges in implementing universal primary education. 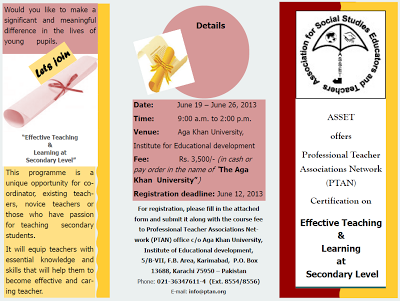 Kindly confirm your participation latest by Friday, May 24, 2013, at registration@ptan.org or (021-36347611-4 /36826991-4 Ext. 8554 / 8556), as this will facilitate us in organizing the workshop effectively. 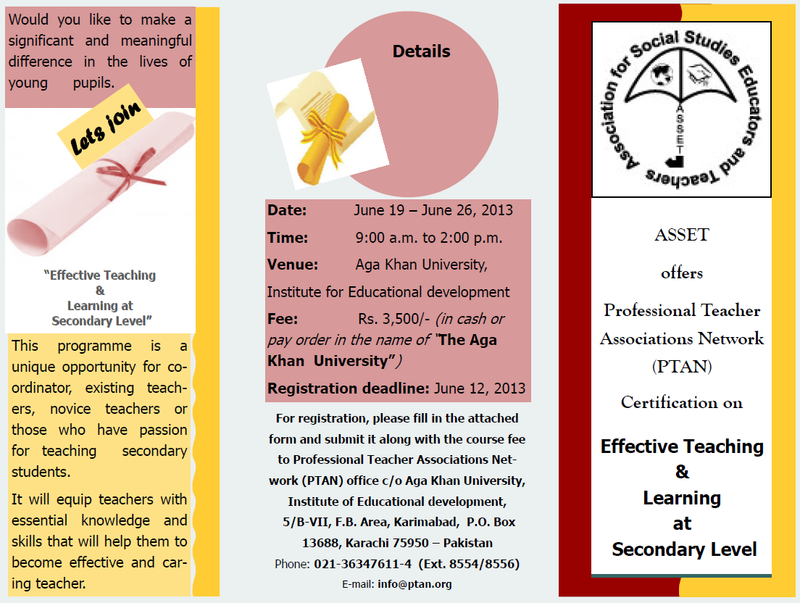 Kindly confirm your participation latest by Thursday, May 23, 2013 at registration@ptan.org or (36826991-4 / 36347611-4 Ext. 8554 / 8556), as this will facilitate us in organizing the workshop effectively.